In my youth there was a game we played on the school yard which was called ‘who is afraid of the black man’. This game is still played. You have a catcher (originally the ‘black man’) who calls out to the group which is standing in about 15 m distance. The group answers that nobody is afraid. The catcher responds that he will then come and get them. Now the group starts to run and tries to reach the place behind the catcher. Everyone who is touched by the catcher changes her role and so the group of catchers gets bigger every round. The winner is the last person which could not get caught. Reading the name and description of the game in today’s context made me perplex… The phrase ’afraid of the black man’ is strongly racist. As I was a child sadly nobody in my circuit cared about this and at that time I had no idea who this black man could have been. I think I assumed it is the chimney sweeper. But today I would not want children to use such a phrase as it is easily misinterpreted. The game is said to be very old, perhaps reaching back into the late middle ages. The description ‘black’ in this game does (presumably) not refer to a darker skin tone but to death itself. The Black man was the personified death who was feared as he could infect everyone through touch with the bubonic plague. This illness was very long named the black death another hint that this game has a gruesome background but initially was not racist. But as so often with oral traditions nothing is absolute. So, it is also possible that the black man in the game describes a black clad executioner or a person infected by the plague. But more important than finding the alleged ‘true’ meaning of ‘black man’ in this game is, that it is not possible to prevent children (or parents) to understand and use the description ‘black man’ in a racist manner. Catcher: Who wants to knit the second sock? Catcher: And if I force you? Group: Then we will run. And I will run too… Currently I have two single socks which are waiting for their counterpart to be casted on. 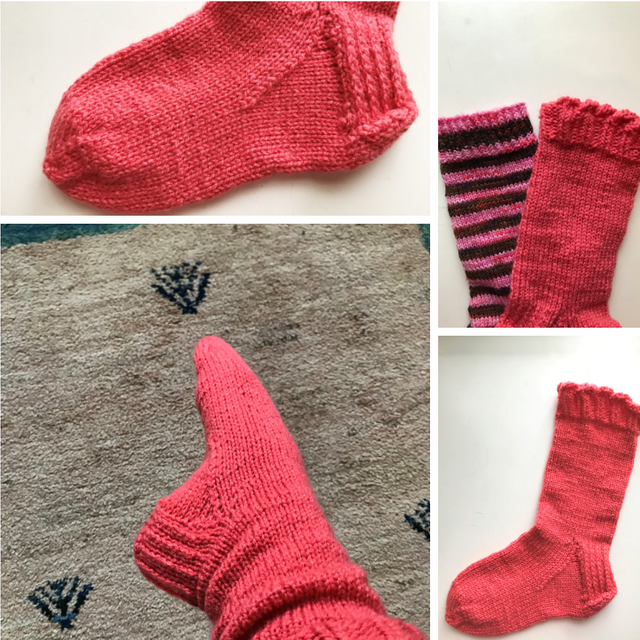 This second sock dilemma is a common problem and @muscara already wrote about the remedy: knitting two socks at the same time on a circular needle. But I so wanted to try out a (for me) new variation of the cuff I did not follow her sensible advice but knitted the socks again on dpn’s. 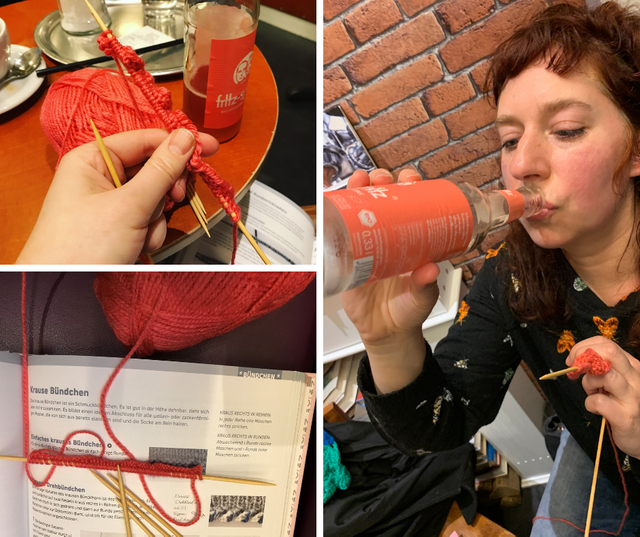 When knitting and drink match in colour…. I started with a rolled cuff. Here for I casted on 48 stitches on a 3 mm needle (the yarn has 120 g on 50 m). I knitted the first 4 rows on two dpn’s flat in garter stitch. The fifth row forms the decorative element. Here I knitted 4 stitches and then turned my right needle with the knitting on it. This I repeated up to the last for stitches. Now I distributed all stitches on the remaining dpn’s and knitted on k2, p2 in the round. As I wanted my cuff a bit smaller I decreased 4 stitches in the second row of the k2, p2. I went on for seven more rows of k2, p2 and then changed to stockinette (about 45 rows). The heel flap I knitted flat and the heel turn I formed by short rows. Now I picked up stitches of the heel and then continued to knit in the round. For 18 rows I decreased every other row 2 stitches at the sides to reach the same stitch count on all four needles. For the foot I started with 42 stitches which I worked in stockinette over 24 rows. As my previous socks had too pointy toes for my liking I changed the decreases for this part. I decreased every other row 4 stitches and short before finishing I decrease every row. I finished the sock with 16 stitches distributed on two needles. To close the sock, I used kitchener stitch (with some beginning mistakes). If you ever want to play this game with your children I would recommend using a fictional figure to be afraid of like the invisible man/invisible woman, a zombie or a monster frog. Racism is still a major problem in our society and nothing (for example this game) which facilitates hate and discrimination should be tolerated. Thank you @crosheille for iniciating and @muscara, @shanibeer, @marblely for hosting the #needleworkmonday. If you want to see more beautiful projects with yarn, fabric and most of all needles, follow @needleworkmonday on steemit. 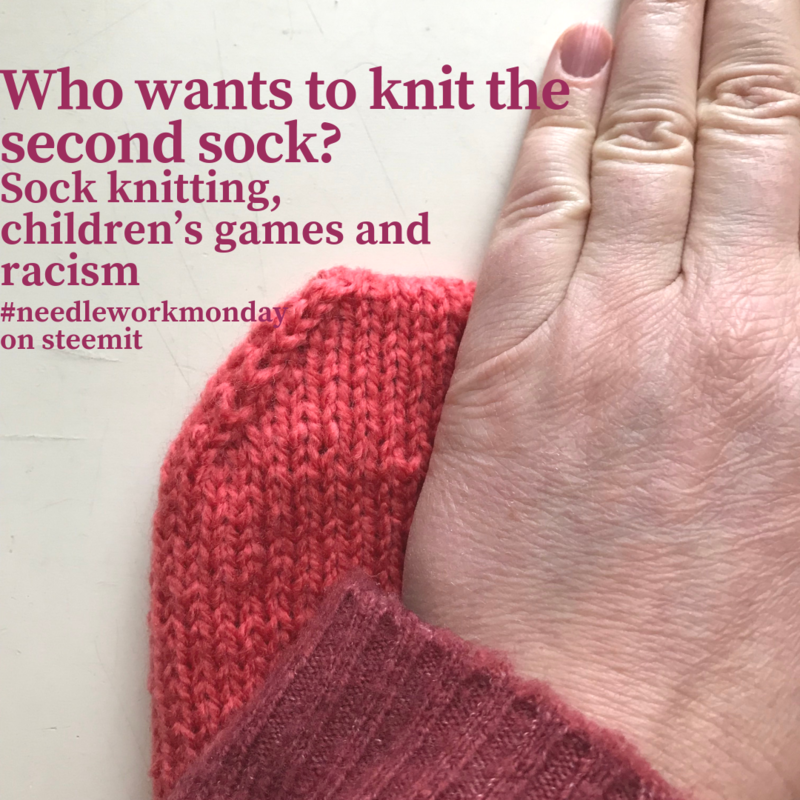 Or even better grab your needles and keyboard and join the #needleworkmonday community. You can read more comments on this post on my steemit blog.